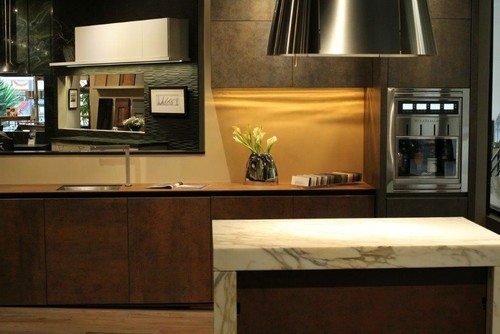 A kitchen design display was recently featured in Houzz featuring the Neolith Iron Corten and Iron Moss. We covered the cabinet door panels with 5mm of the material and covered the counter’s surface with 10mm of this material to provide seamless design with a clean and simple eased edge. Neolith is a revolutionary porcelain surface that combines high performance specifications, trendy colors, varying thicknesses, and versatility for applications (countertops, bathrooms, kitchens, paneling, flooring, and more). In our particular design space we chose Neolith’s Iron Corten which comes in four color choices, but unique elements. The oxidation of the metals bring to light the copper tone and bright reds of Corten steel, but also emanates the grays of the forged irons. The design possibilities are endless with this material that also comes in Iron Copper, Iron Grey and Iron Moss, which we mixed within our kitchen design. The material is very versatile and offers an earthy element with innovative design into any room in the home. It is a great solution for kitchen and bathrooms because of it’s resistance to high temperature, is waterproof and has almost zero level of absorption, hygienic, resistance to wear and tear and bending. It is a lightweight, but strong and sturdy material. For more technical specifications on this product please visit, Neolith. For more information on home and kitchen design call our team of design professionals today!